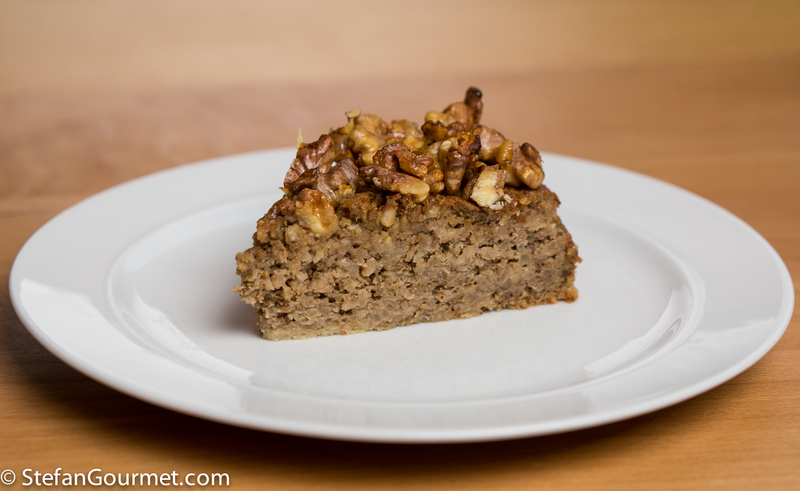 I’ve adapted this parsnip and walnut cake from a recipe I liked on Simona’s blog Grembiule da Cucina. 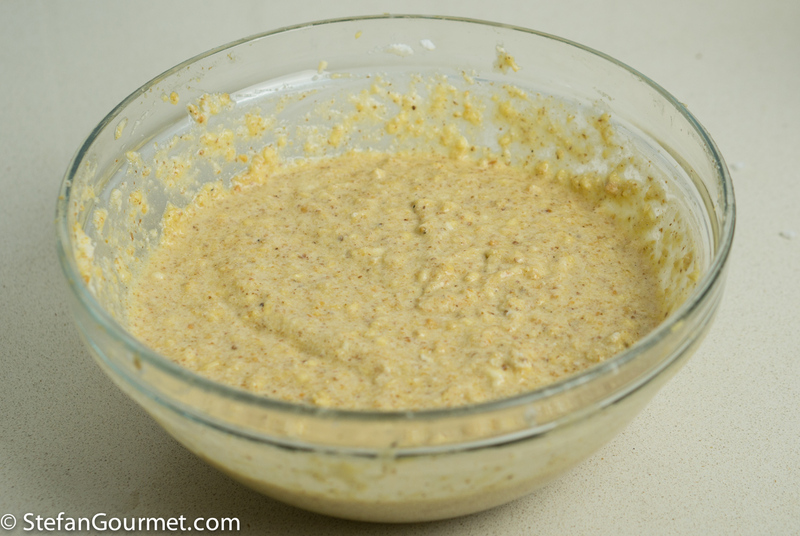 The combination of parnip and walnut works very well, and to brighten up the woody flavors I added some ground aniseed. 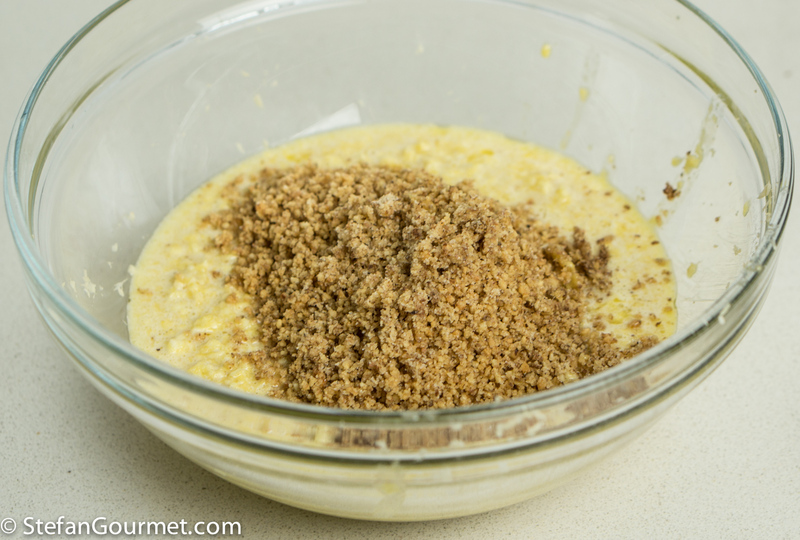 To make the cake even more flavorful as well as gluten-free, I replaced the crumbled biscuits in the batter with ground walnuts. 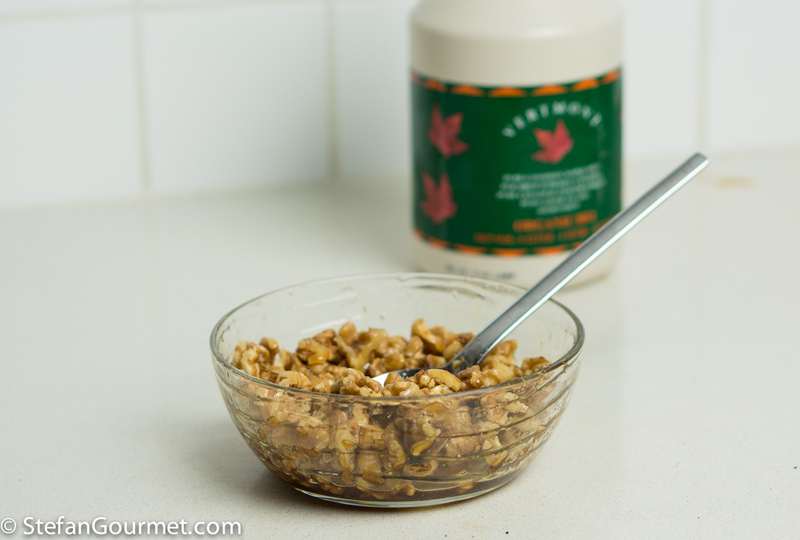 To flavor the crunchy walnuts on top, I used maple syrup and a pinch of salt. 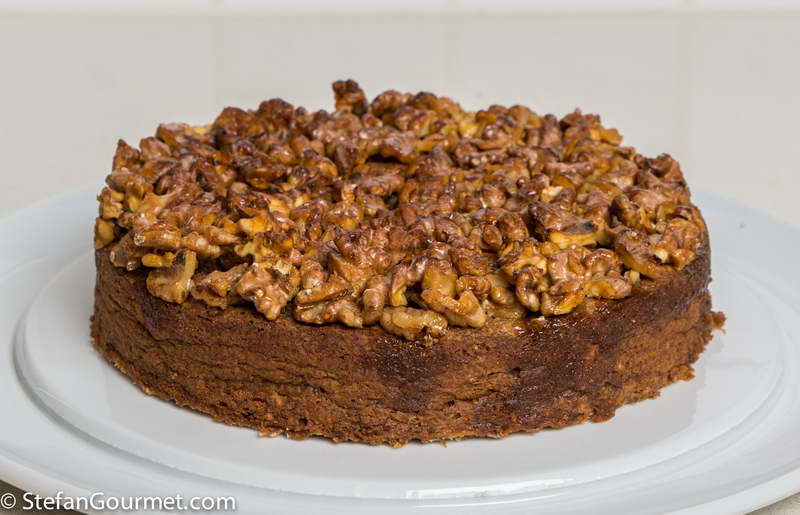 This is a wonderful cake with a nice contrast between the moist body and the crunchy walnut topping. Simona, ti ringrazio per l’ispirazione. Ecco la mia versione. Preheat the oven to 180C/350F (not fan forced). 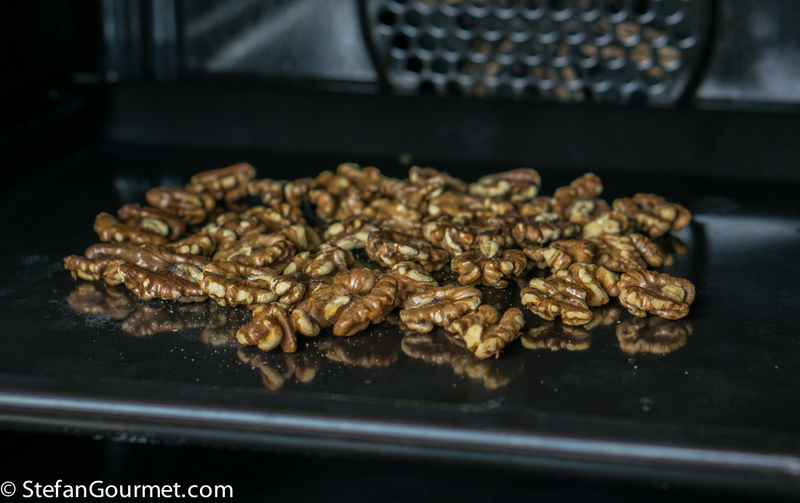 Toast 200 grams (7 oz) walnuts on a baking sheet for 8 minutes, then allow them to cool. 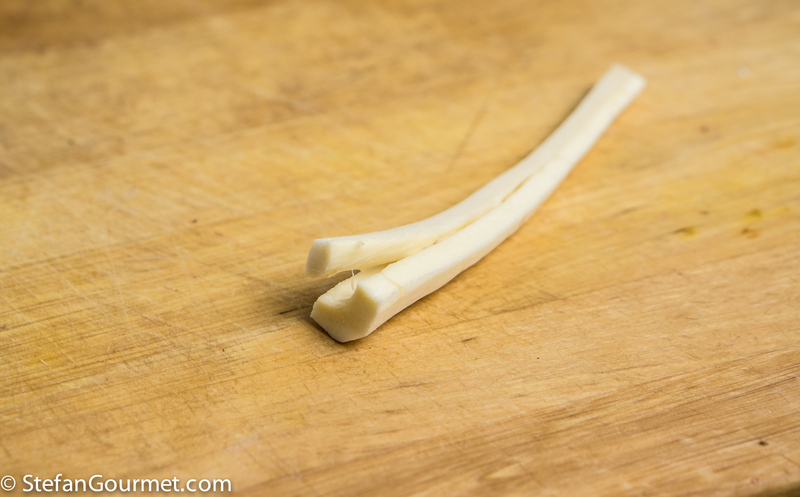 Meanwhile, peel the parsnips, cut them in quarters lengthwise, and remove the woody inner core. Once you make a start with a small knife, the core will come away easily. You should end up with 200 grams (7 oz) of clean parsnip. 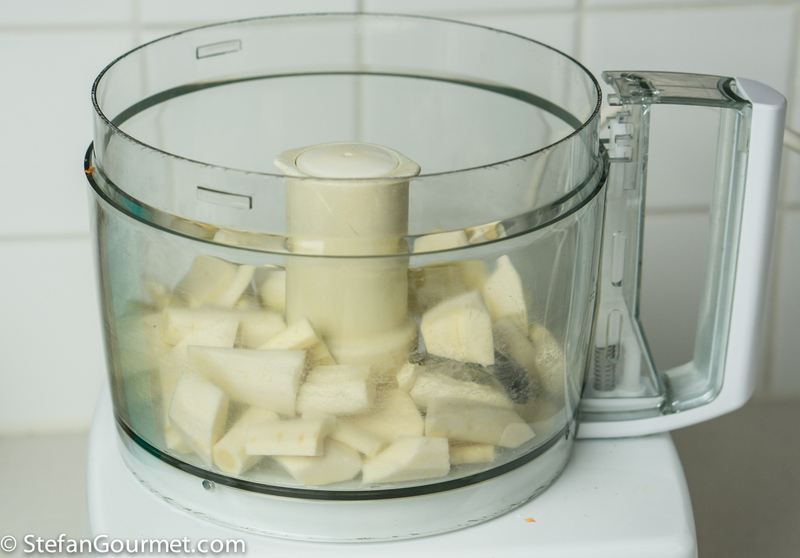 Roughly chop the parsnip and put it in the food processor. …until it is quite fine. 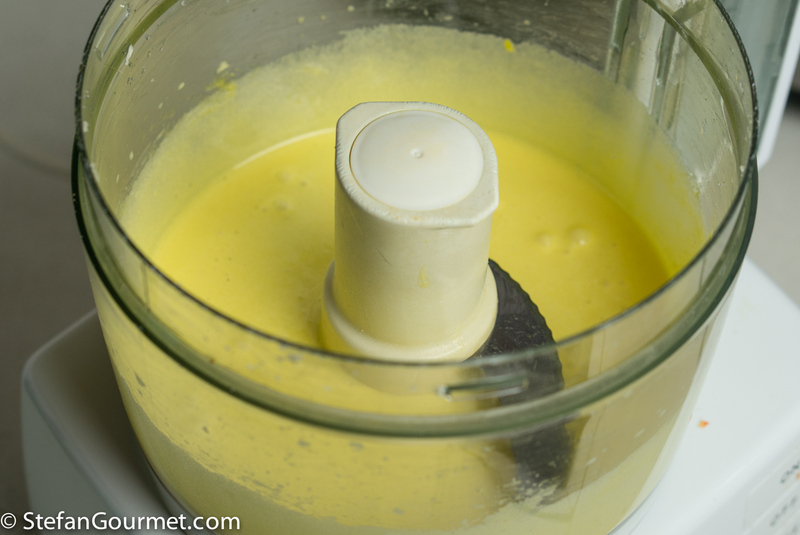 Melt 100 grams (7 Tbsp) of butter, then allow it to cool somewhat. 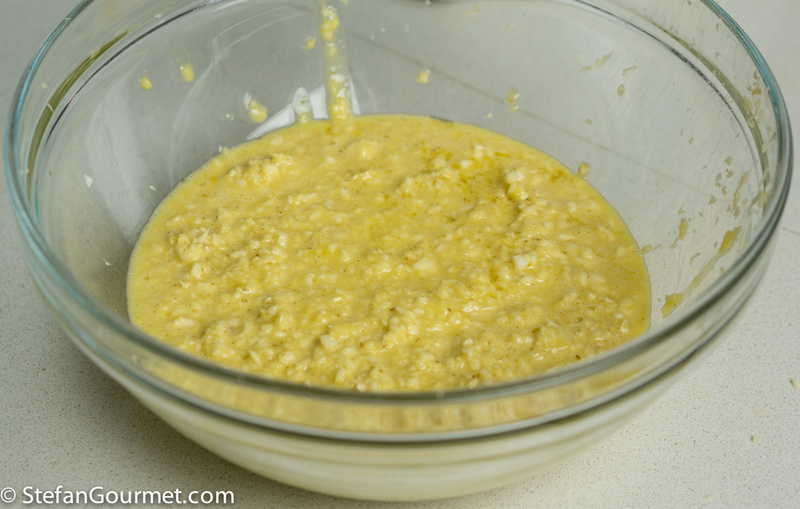 Beat 4 egg yolks with 100 grams (1/2 cup) of sugar until it is pale and creamy. Add a teaspoon of ground aniseed or fennel seed. 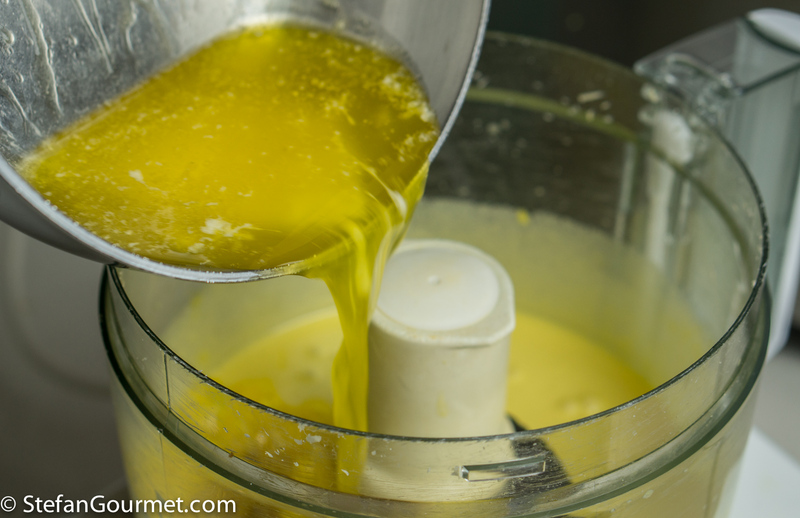 Add the melted butter, making sure it is not too hot as otherwise the egg yolks will cook. 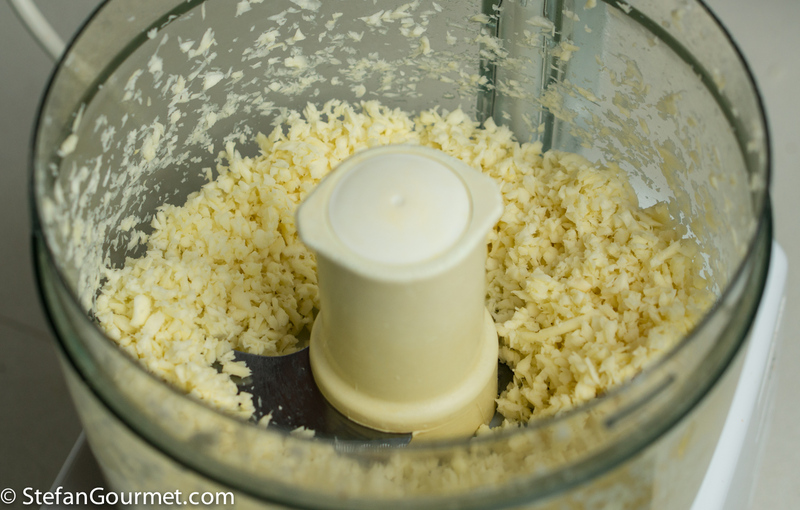 Process briefly to incorporate the butter. 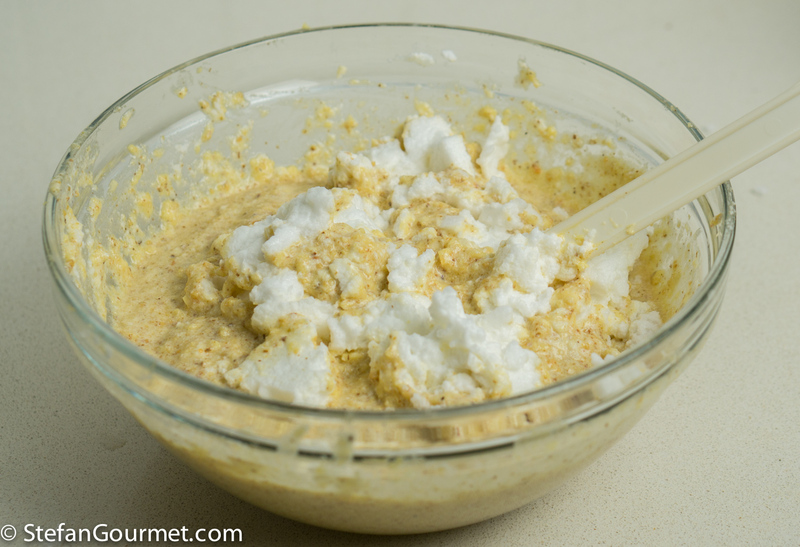 Combine the butter and egg yolk mixture with the ground parsnip in a bowl. 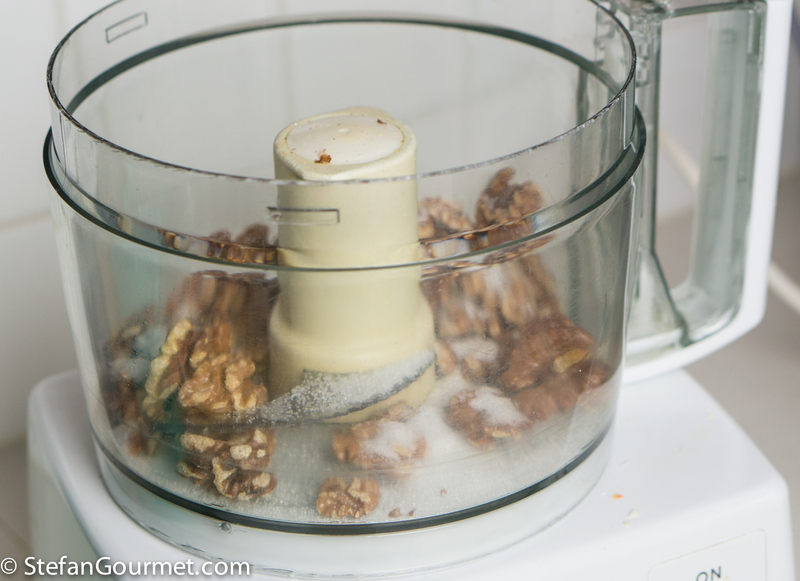 Put half the walnuts and 25 grams (2 Tbsp) of sugar in the food processor. 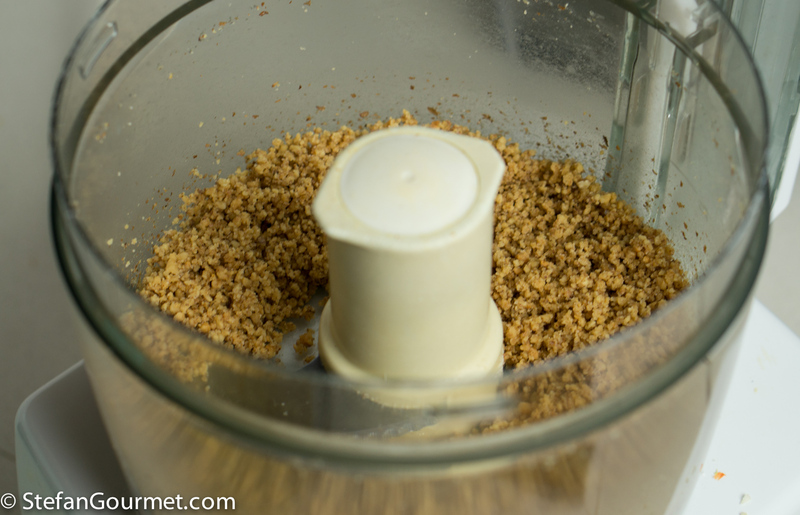 Grind the walnuts into a coarse powder. 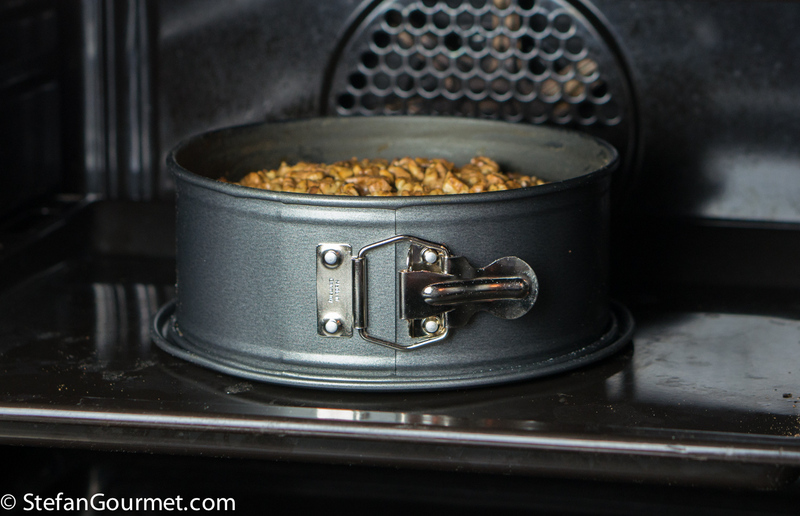 The sugar helps to absorb the oil that will be released by the nuts. Add the ground walnuts to the parsnip mixture and stir to incorporate. 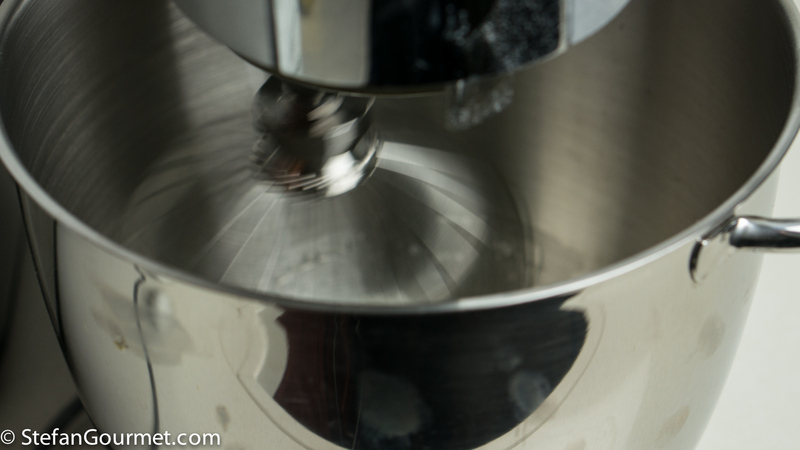 Whip 4 egg whites with a pinch of salt until it resembles snow (or until the ‘soft peaks’ stage). 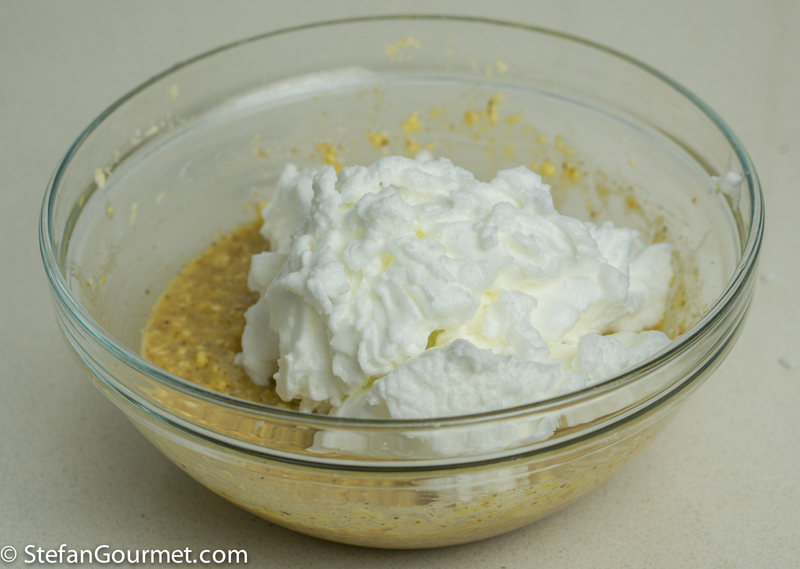 Fold the whipped egg whites into the parsnip mixture in three additions using a rubber spatula. 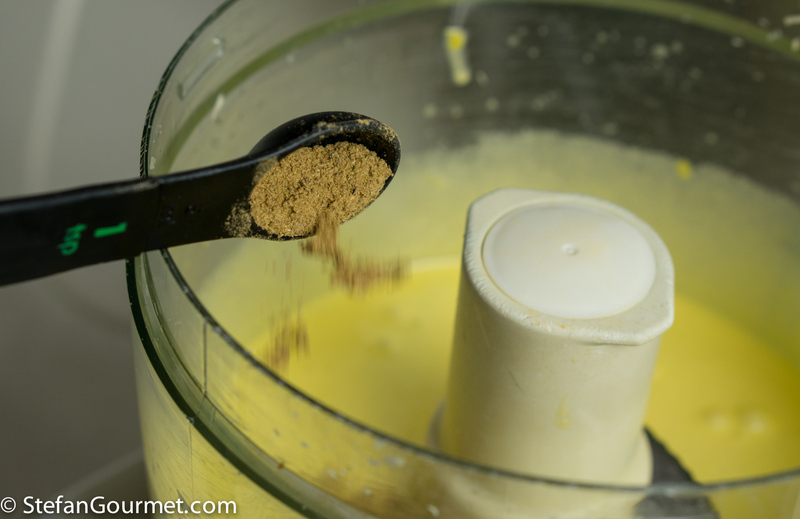 Try to keep the mixture as airy as possible by making gentle movements with the spatula, starting at the bottom. Continue to fold in the egg whites until the batter is homogeneous. 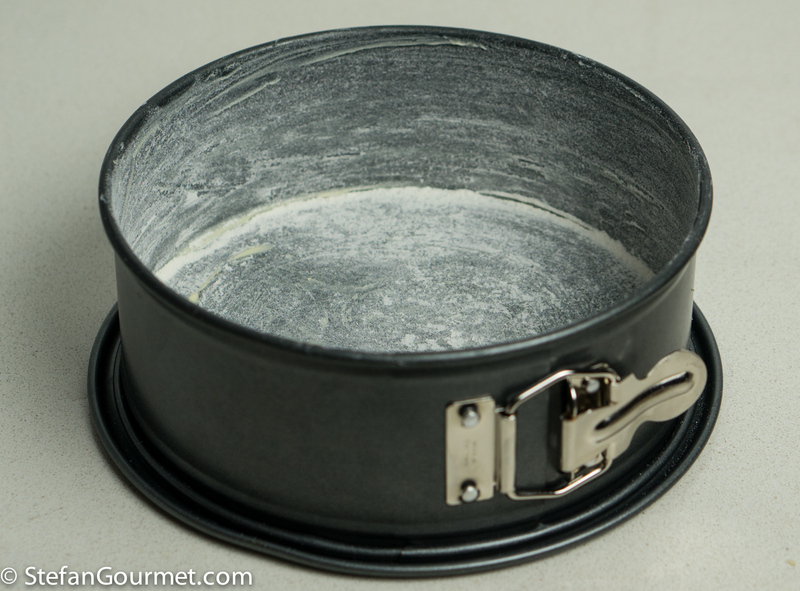 Grease a 20 cm (8″) springform pan with butter, then dust it with flour. 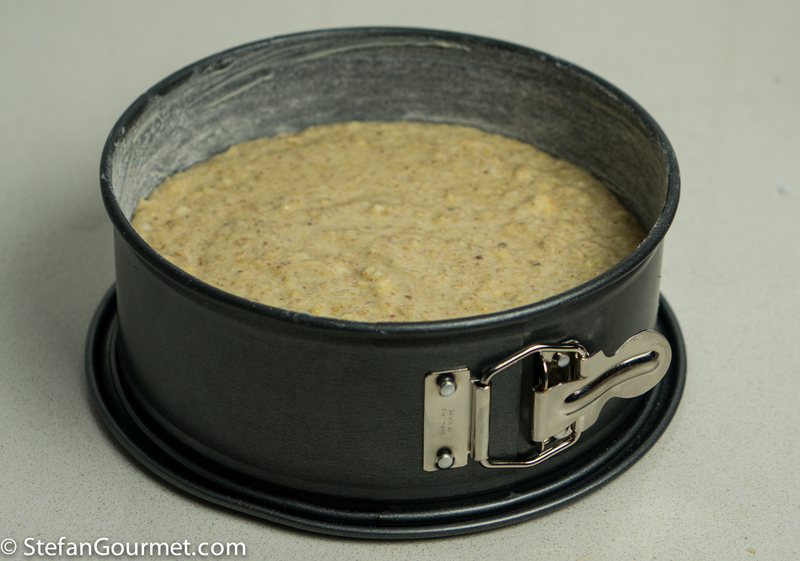 Bake the cake for 45 minutes at 180C/350F (not fan forced). In the meantime, roughly chop the remaining 100 grams of walnuts and add 2 tablespoons of maple syrup and a pinch of salt. 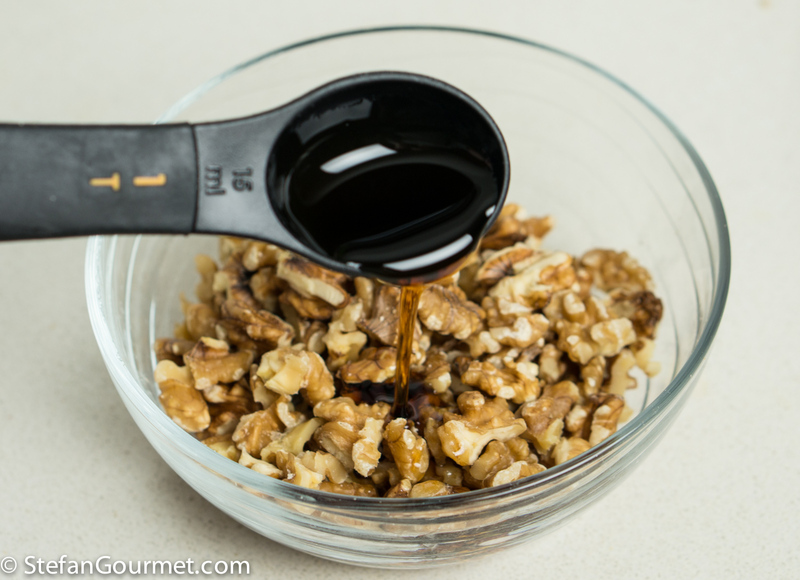 Stir until the walnuts are coated with maple syrup. 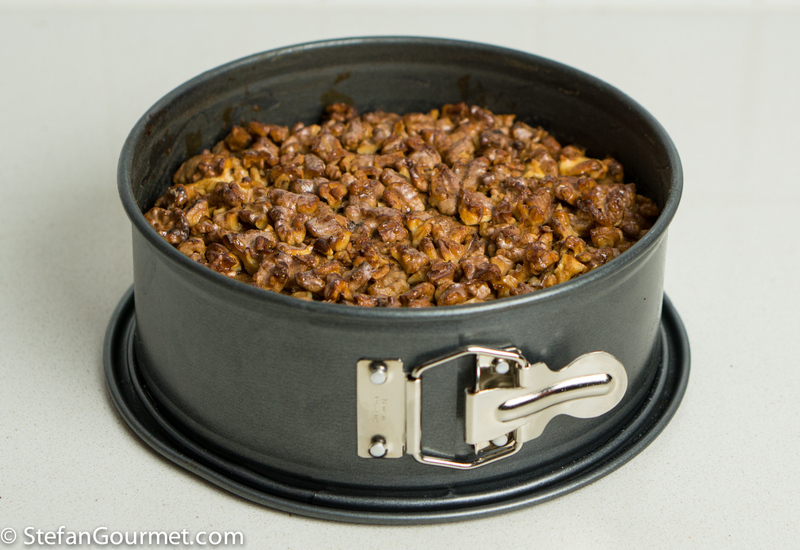 After 45 minutes of baking, take the cake out of the oven and arrange the walnuts on top. 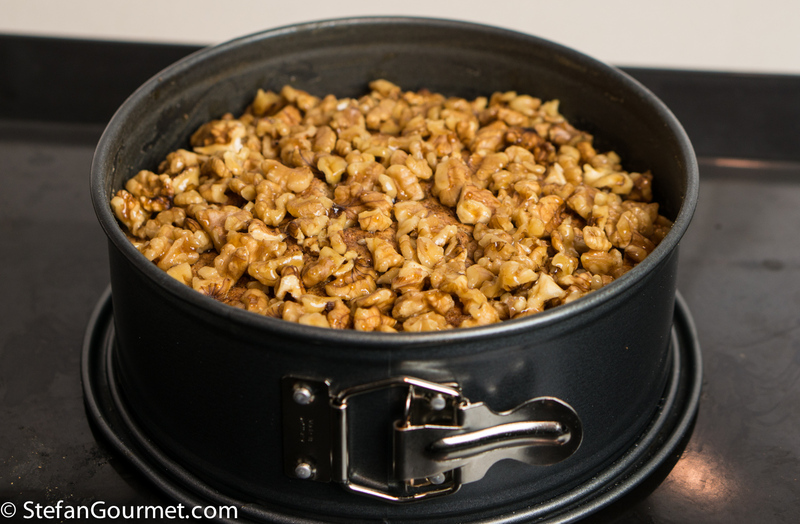 Return the cake to the oven for a final 10-15 minutes of baking and toasting the walnuts on top. Test whether the cake is done by inserting a toothpick in the center, it should come out clean or with some crumbs attached. Take the cake out of the oven and allow to cool in the pan. Wait until the cake has cooled to room temperature before transferring it to a serving plate. This is great with a passito (Italian dessert wine made from dried grapes) that has been aged in wood. 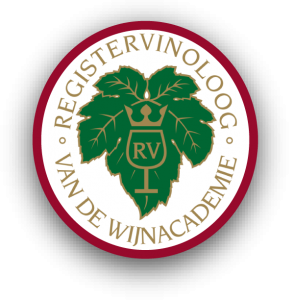 The woody wine will work well with the woody cake. 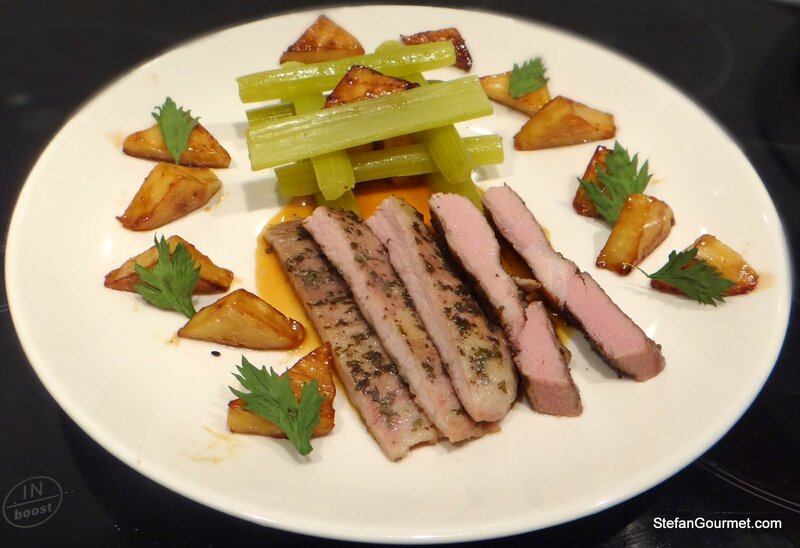 Iberico secreto sous-vide with celeriac fondant sous-vide is a dish with a lot of flavor, showcasing how flavors can be enhanced by cooking sous-vide. Thank you for the step by step photos, without them I would not even think to make this cake, never worked with parsnip in baking. Now I am truly tempted. Your cake looks magnificent! Grazie Stefan per questa interpretazione davvero straordinaria per una torta di pastinaca! Grazie anche a Libera, perchè senza di lei non avrei mai pensato di provarla! Non ho mai provato la pastinaca. E’ ora di farlo. Ricetta fantastica. I love those rustic Italian cakes Stefan. Bookmarked it to try out. Lovely. You always inspire me to try something new! I just baked a similar cake yesterday, minus parsnips – Next time I’ll try your version! 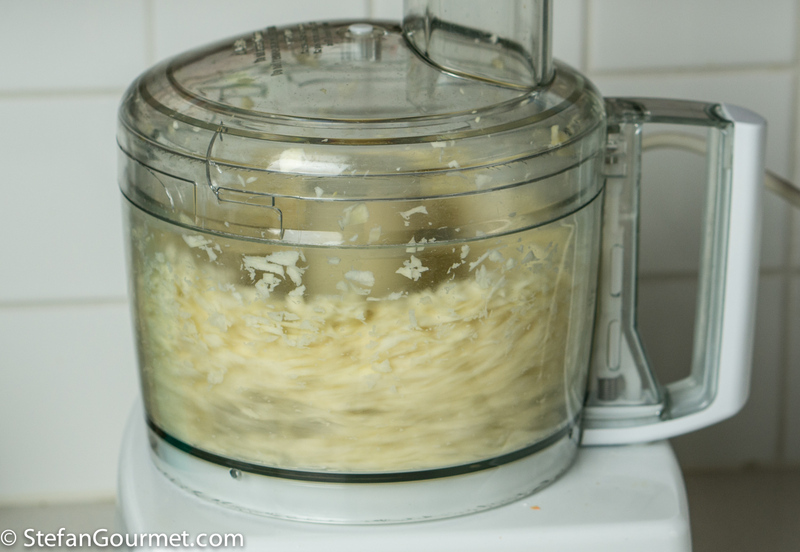 PS – I’ve found that pressing down gently on egg whites with a slotted spoon is an efficient yet effective way to incorporate them into a batter while preserving air. Do you have gluten allergies in the house? I am trying to recall if you ever mentioned that or not. Anyways, a beautiful cake! What a fantastic use for parsnip. I really should make one of these. Tks Stefan! Just made this fantastic cake! Very special! One of the very few sweets I would love to have a bite of!